Over at the SDR for Mariners blog, Akos has put together a write up on his methods for cooling the RTL-SDR dongle. Cooling can help reduce temperature related frequency drift, which occurs as the dongles crystal oscillator heats up over time. One of his recommendations is to try oil cooling the dongle. This involves completely immersing the dongle in sunflower or vegetable oil. 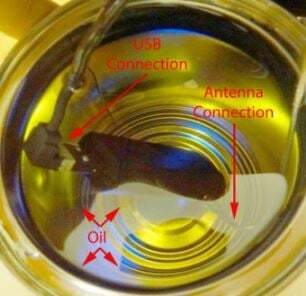 Since oil is not electrically conductive, it will not short the circuits, and the oil will help to dissipate the heat buildup generated by the dongle. Some of his other recommendations involve drilling extra holes in the dongle casing, and adding fan cooling.